2 Nash Bits Bag Carp Fishing. Condition is Used. Dispatched with Royal Mail 2nd Class. Nash Tackle Reversable Bomber Jacket Carp Fishing Coat. removable hood. Very good condition. Tiny hole near right pocket(pictured) Happy bidding. Please have a look at my other items. Pair of Nash BP6 quick drag carp reels, good used condition loaded with 15lb subline.. Tried to show the condition in pics, some small scratches and worn paint around outside of line rotar arm but apart from that are in good clean used order.. Featuring Nash's patented internal line connection system that eliminates the age old problem of weed and debris clogging around a swivel, Spot On floats are the ultimate markers. Spot On Marker Float. 6 x size 8 barbless withy carp rig in nash combi link silt. fools the carp every. 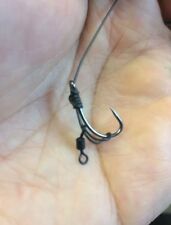 MB CARP RIGS. connect straight to lead clip or inline setup via a quick link. 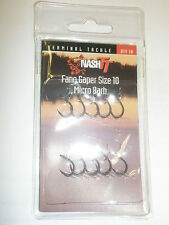 Nash Quick Change Paste Coil Rigs size 12 barbed with 12lb hooklink. Condition is New. Dispatched with Royal Mail 2nd Class. 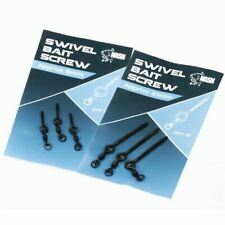 6 x 20lb nash combi link silt size 4 barbed carp rigs. 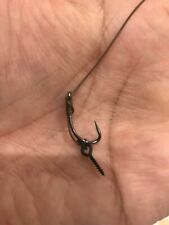 M B CARP RIGS. black is perfect for using in dark silt. hand tied that works really well an anti eject rig. Available in 7, 15 and 30 gram. Redesigned for even better performance Bolt Machines are as versatile as they are deadly. Bolt Machine. 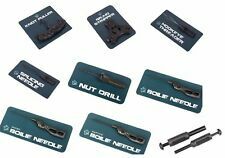 - CAD designed for maximum bolt effect and self-hooking. Key Features. Condition is Used and in great condition. Loads of pockets and features a detachable cool bag base that has its own strap. Very comfortable to wear.